It’s May already. Tomorrow June begins, marked with a solar eclipse. But this post is about a couple of events Jim and I attended on the Olympic Peninsula during March and April. When I mention the Olympic Peninsula, I mean to include all the little peninsulas that make up the grand Olympic side of Washington. 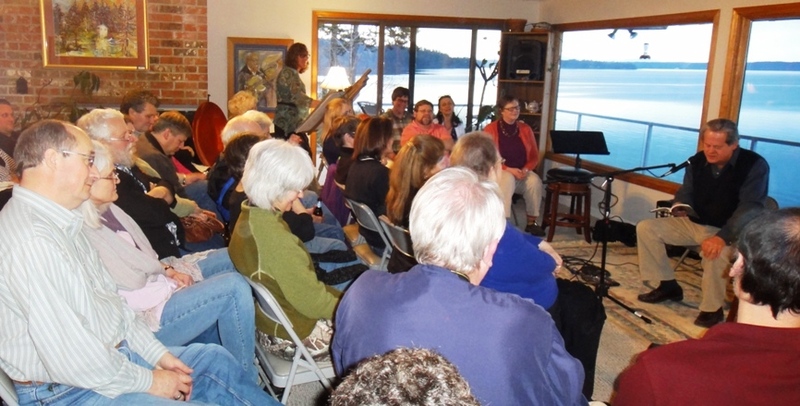 First, on March 12, Jim and I attended the Jazz Canvas event in Poulsbo with Andy and Lana Ayers. This venue is in the Knowles’ art studio. The jazz trombonist J. Kyle Gregory performed with the house band while the artist Leigh Knowles Metteer worked on a painting inspired by the evening’s music. Great music! And the artist was lively and even invited an audience member to add some creative elements to the painting. As the evening came to a close, the painting was finished and was raffled off. So someone went home with a nice piece of art, and we all left with our culture passions satisfied for the moment. This event happens almost every month, so check out the website www.jazzcanvasonline.com for more information. Then, on April 8, Jim and I went to Vaughn for another similar event, again with our good friends Lana and Andy. There was an artist painting and a musician playing, but this time, Jim and I were invited to read poetry, too. It was a wonderful evening, full of a substantial amount of excellent vittles, from lox to brie to wine to whatever your heart desired. The musician was Cheryl Wheeler from the East Coast. 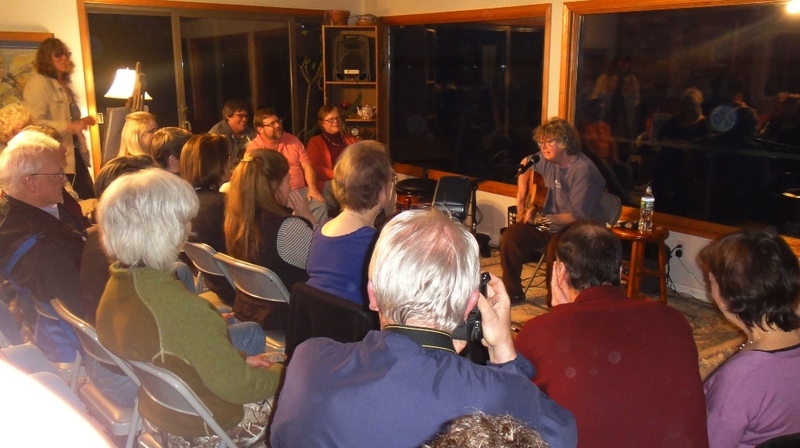 The audience was approximately fifty people jammed nicely into the ample living room, and behind the guest musicians and poets was a view of small inlet of Puget Sound. A hummingbird feeder hung from the eaves, busy with the little birds. into my own blank page. Lisa is a fine poet whose poems I’ve enjoyed since the first time I heard her read at the Auburn Arts Festival. I especially love inspiring others and being inspired by others. It’s a kind of splendid impromptu collaboration. Speaking of inspiration, Chris Jarmick will be the next guest poet on June 2. The photos on this blog post were taken by our host, Jerry Libstaff. 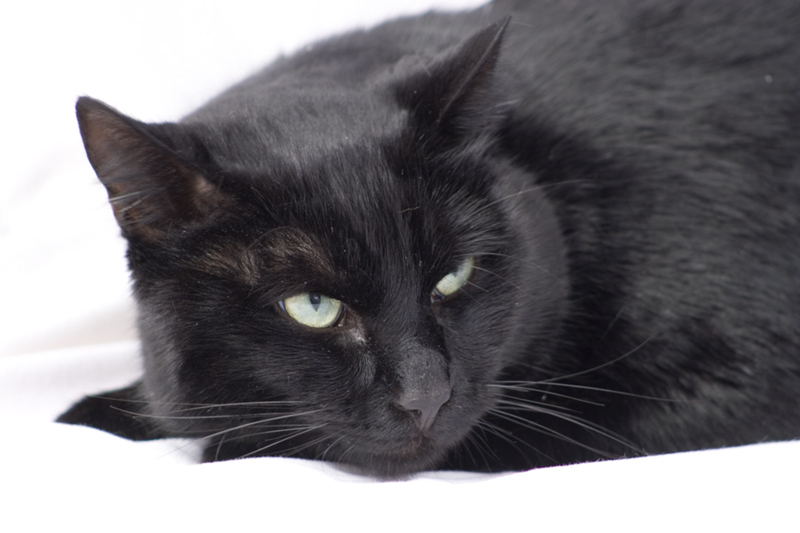 Black cats are less likely to get adopted from an animal shelter than any other cat. Normally, Monday being a work night, I like to get enough sleep to be fairly awake next morning at 7 or so, after a good cup of coffee and a hot-hot shower. Then there’s PoetryNight, which begins after 8 on a Monday evening and continues until late, or at least past my bedtime, given the extra chores with the horse. But when Robert Huston invited me to feature at PoetryNight May 16, I agreed. 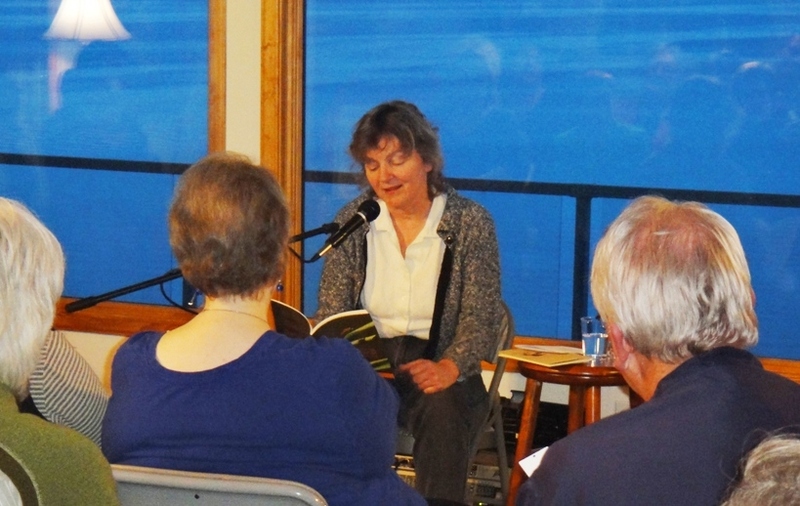 PoetryNight features usually have a new book to read from, and that is the case with me—with my new book What the Alder Told Me. I’m pretty excited, and even intimidated by this poetry reading. Have you heard the poets there? The features are excellent, and so are the poets who read at the open mic. In fact, I’ve declined reading at the open mic almost every time I’ve been there because the poets are so good that I just want to hear them, and the sign-in sheet always fills up. I don’t remember when I went away disappointed. So this is an event worth going to, not because I’m featuring (though I’d be very happy to see you there), but because every Monday there is outstanding poetry read live on stage. The quality of the work, the poets and the audience exceeds expectations… by far. This is an invitation to come to PoetryNight May 16 to hear poems from my new book, and the great local and not-so-local poets who will share the mic with me.